Most councils are giving a good and improving service to local people, according to a watchdog body. An Audit Commission report for councils in England looked at performance across a range of services such as education, elderly care, housing and recycling. Some 55 local authorities achieved the top four-star rating, 68 got three stars and 23 received two stars. The number with one star fell from five in the previous year to two - Liverpool and Rutland - and none were zero star. 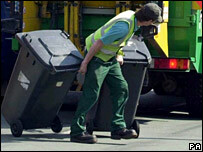 The commission's Comprehensive Performance Assessment for 2007 found 13 councils were both top-rated and "improving strongly". Camden, City of London, Kensington and Chelsea, Kent, Shropshire, Tameside, Wandsworth and Shropshire were in this category for the second year running. They were joined by Bracknell Forest, Gateshead, Leicestershire, Somerset and Sutton for 2007. Two authorities, Lambeth and Stoke-on-Trent, jumped two star ratings from 2006, while Bedfordshire, Hackney and Sefton have improved in each of the past two years. Audit Commission chairman Michael O'Higgins said the report was "good news" for taxpayers. He said: "The 2007 results show that councils continue to rise to the challenge of delivering better services for local people at better value for money. "Most English councils are in a strong position to take on the more demanding role now expected of them. "Where there are challenges, we know the characteristics they need to copy from the highest performers - strong leadership, a skilled management team willing to take tough decisions and an ongoing focus on poorly performing services." David Shakespeare from the Local Government Association said councils should not rest on their laurels. "Councils are already the most efficient part of the public sector, making efficiency savings of £100m a month, and these figures show that town halls are continuing to improve. "However, complacency is not an option. All councils must strive to match the best in the country and the highest performers need to keep on providing local people with top-quality services."